g54 | fun with friends and fedoras, despite the loss . 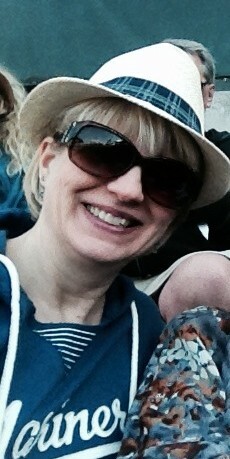 . .
‘t was a beautiful night to be at the ballpark with friends (and the fedoras were a fun bonus!) . . . tons of Tiger’s fans though! Kuma’s outing was a bit better than the stats appear – but those Tiggers made.him.work . . .
(were those Tigers batting averages on the left side of the Safeco Field scoreboard or Bengals defensive lineman’s weights?). There were some extenuating circumstances in the 5th – with ONE out, ONE on, Hunter was originally ruled safe but, it was over-tuned on replay. The sad thing was, Kyle bobbled the ball so he was unable to start the DP that would have ended the inning. Instead there were TWO on for Martinez (after Cabrera was IBB’d) who deposited one in the RF seats (after a TEN pitch AB). Anyhoo, after a ton of pitches (98) Kuma was done . . .
Only SIX hits, but FOUR of them for extra-bases . . .
With Maurer being sent down, #Mariners obviously will need fifth starter. But don't need to add anyone until next Tuesday at Atlanta. No number of pick-off throws can prevent James Jones from stealing second. He now leads the #Mariners with five stolen bases this season. Ugh. IBB Cabrera to face VMart. Don't like it. This entry was posted in GameDay, HOME and tagged Chavez, DET, Furbush, Iwakuma, Jones, Medina, Saunders, Seager, Zunino. Bookmark the permalink. ← g53 | lose, WIN, lose, WIN, lose ~ I’m sensing a pattern here . . .